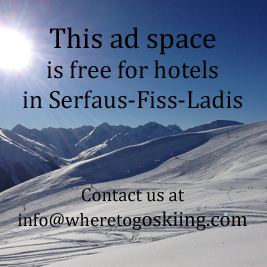 Serfaus-Fiss-Ladis is a very well-connected area and when you are on the mountain it seems more like one big area than 3 connected ones. It covers an elavation of between 1,200 and 2,820 metres which is quite high for Austria. There are trails for beginners, for family and for advanced skiers – especially the 12 km long trail, Frommesabfahrt, is really exciting. Intermediates will ski it with several breaks whilst advanced skiers will find it challenging to run from top to bottom and see if they can beat their friends! Just home from a wonderful week in Serfaus – I really like this area, especially the long runs (Frommes abfarth is 12 km I think!) and the black pistes in each side of the area. Very recommended. I have been to Fizz once, and I will definitely not return. The slopes are not very well connected and the meeting points were all too crowded. There were people everywhere and it was too chaotic for my taste. Nice area where you will find very varied skiing, as other reviewer mention beware of the middle area in the afternoon as everyone is crossing through here and it can be a bit chaotic when skiers cross eachother trying to get in all different directions. But the pistes on the “outside” of the area is really good and not at all crowded so we learned to just go out here immediately in the morning to get the best skiing. We have been coming back to this area many times as it seems to be the perfect place for our family. The area is easy to find your way around, well connected between the 3 villages and very snow sure due to the hight of the area. Serfaus and Fiss ground gondolas can be a bit crowed in the morning but once you get up into the area eveything is well-functioning and easy to get around. Visited Fiss one time and it is a nice place, but when I was there it was quite crowded and with long lines to get on the main gondolas. At the far left and right side of the area you will find some really great trails with just a few people, but in the middle of the area it can get really crowded and many trails crossing each other. The long run – 10-12 km (?) is reaaaly cool! Seeking Business Analyst to support the Medicare Claims system in Plano TX ,CV to sachin.kumar1 @agreeya.com !